Apple fans are annoyed at latest Samsung advert lampooning the iPhone because it uses an older model 6 against the latest Galaxy S9 to focus on battery performance. Some Apple iPhone fans aren’t amused at the latest advertising from Samsung, makers of arguably the iPhone’s main competitor range of smartphones with their Galaxy and Note models. Some Apple aficionados have taken to Twitter and other social media platforms to express indignation about the South Korean electronic giant’s latest advert featuring its latest incarnation of the hugely popular Galaxy – the S9 – showing favourably against an iPhone. The latest Samsung advert – known as ‘Moving On’ – shows a woman being let down at various stages of her day by her slow performing iPhone as it takes too long to load and runs out of battery power amongst other things. Meanwhile a user of the latest Samsung Galaxy looks on with faint amusement as his phone serves him perfectly by comparison. Samsung has advertised in this way before in taking known drawbacks of the iPhone and using them to highlight how its own smartphone is better; this time it’s the well documented battery slow down issues of older iPhones. It was revealed that Apple had added software to deliberately ‘choke’ the performance of iPhones to compensate for when battery life declines as the phone ages. Batteries aren’t user replaceable on iPhones, so the user has no choice but to either accept slower performance or pay for the battery to be replaced. The company responded to the ‘slow down’ criticism by offering vastly reduced battery replacement costs. Most Samsung smartphones down the years – including some available used such as the now cheap Galaxy 7 – have user replaceable batteries. The social media uproar amongst Apple fans stems from the fact that, in this latest advert, an older model iPhone – the 6 originally launched in 2014 – is being used as opposed to the current 8 or X versions while the Galaxy featured is the very latest S9. It was older iPhones that suffered from the battery slowdown hence their use on this occasion, and it does say in small type on the screen early in the advertisement that the model shown is an iPhone 6 and that newer versions of the smartphone are now available. It also adds that close up screen images were simulated. One Tweet responding to Samsung’s advertising made the point that two could play at the game of highlighting the other’s weaknesses; after all, Samsung had to stop selling the Galaxy Note 7 after several owners experienced theirs catching fire, so Apple could respond in kind but have so far resisted the temptation. Another subtle dig at Apple included in the latest advert and used before is featuring a man with a ‘notch’ haircut at the fringe. This is to illustrate the so-called ‘notch’ on the flagship iPhone X – a solid area at the top of the screen that otherwise features very slim bezels – that has come in for some criticism from reviewers. 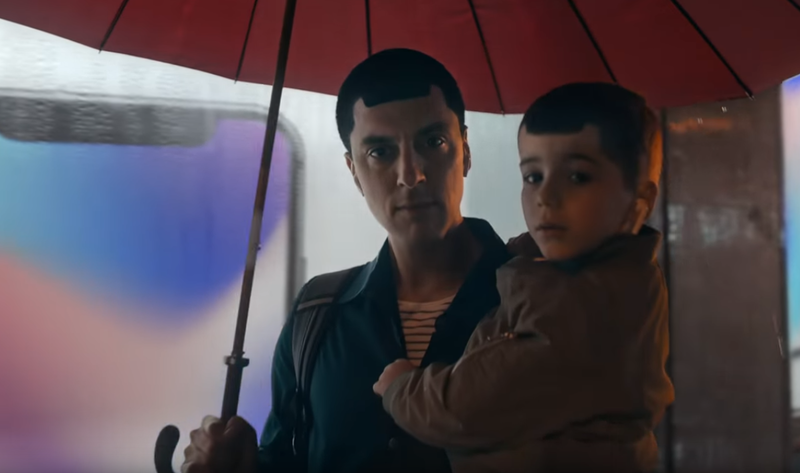 In the latest advert the ‘man with the notch’ is joined by his young son who has an identical haircut. Samsung v Apple – who will win? It’s clear Samsung enjoy lampooning their key rival and show no signs of letting up; meanwhile some iPhone fans perhaps dream of the day when Apple’s marketing department decides to hit back with some counter advertising of its own.